Tea and baseball might not seem like a likely combination, but we think it’s all part of being part of a communi-tea! We have so many teas and sweets, our menu can be a bit overwhelming. Of course you can choose any pastry and tea you like, but if you could use a suggestion, our staff would be glad to help! One wonderful combination is our Vanilla Almond black tea and any sweet treat. The creamy vanilla and sweet almonds in Vanilla Almond tea makes it a true dessert tea. Pair it with our scones and add Devonshire cream and raspberry jam for a perfect morning or afternoon treat! Secret Garden’s Online Shop is Live! Our new Online Shop is live! Have our delicious teas delivered straight to your doorstep, so you can enjoy the Secret Garden experience at home, at work, or with friends. Our teas and gift certificates make wonderful gifts too! …or if you prefer your picnic outdoors, try our High Tea To Go! Tea at the Garden is the ultimate tea experience, but you can enjoy the Secret Garden High Tea anywhere you like. We suggest a quiet picnic in the park, a luncheon with friends…or a surprise tea party for someone! Wherever you enjoy your tea, it’s sure to create a special moment, and the perfect tea break. August Breakfast Special: Free Mini-Scone! 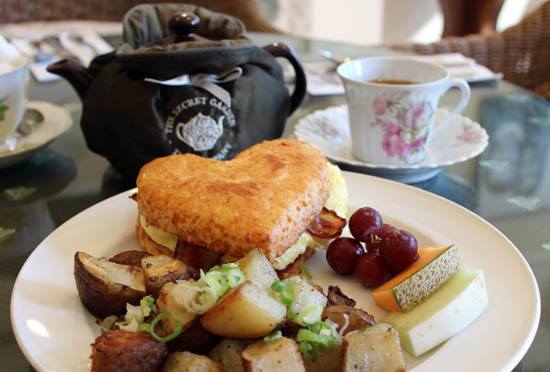 Scones, pancakes, omelettes, French toast…and tea of course! Breakfast at the Secret Garden is always a great start to the day. Now for the month of August, you can enjoy a free mini scone with breakfast. Simply mention the August Tea Special to receive your free mini scone; minimum order is $7 per person. Please note we’ll be closed August 4-5. Other than that, we’re open daily for breakfast, lunch, and high tea. We hope to see you soon! Pictured: Freshly baked cheese breakfast scone with bacon and eggs, hash browns, and fruit. At The Secret Garden we enjoy so many teas from India. Sponsoring students is one way we can give back to this amazing country. Since 2006, we have sponsored students through a local charity called HUGGS Canada, a nonprofit dedicated to helping low-income students in India receive education. Thanks to HUGGS Canada, Krishnaveni received a teaching degree and is now helping other children in India learn vital skills. We’re very grateful to help students like KrishnaVeni grow and flourish! On Wednesday, July 16, the Secret Garden is hosting a special event! Secret Garden staff member Jessica Viloria will be giving an interactive workshop on healthy fats and nutrition. During this fun one hour event you’ll learn why our bodies needs fats, try two different food samples, sip Secret Garden tea, and receive special recipes to take home! Food tastings will include one of Secret Garden’s scrumptious salads with an alternate dressing, and an easy cocoa dessert. This special event is free of charge; donations kindly accepted. Seating is limited, so please RSVP today by calling 604.261.3070, or click here to sign up online. Jessica is a student at The Institute of Holistic Nutrition, where she is studying how to provide proper nutrients that the body needs to thrive, heal and prevent disease. She’s also learning how to treat the body as a whole with each person as an individual through food, natural supplements, stress management techniques, and other holistic approaches. At the Secret Garden, we believe tea time is an important time of the day–whether you pause for tea in the morning, afternoon, or evening. In this busy modern world we live in, taking a tea break gives you a quiet moment to relax and catch your breath. And often, a sweet or savoury treat can make your tea time even more delightful! One of our most popular sweets is our Mini Lemon Tart. Our light, buttery tart shells, crafted by our pastry chefs, each hold a perfect mouthful of creamy lemon filling. The tarts are sweet, with just enough lemony tang. Any tea will go great with our sweets. However, one lovely tea pairing for the tarts is the Anniversary Blend Black Tea. We created this tea in celebration of Secret Garden’s inception: Smooth black tea blends with citrusy bergamot (the classic flavor in Earl Grey tea). On top of this, we layer floral jasmine flowers and creamy vanilla. With sweet vanilla and citrus notes, the Anniversary Blend complements the Mini Lemon Tarts to a tea (pun intended!). We’d love to host you at our tea room in Vancouver the next time you could use a little tea break. Try this tea pairing or find your own yummy tea and treat combination! You can also order our Lemon Tarts To Go, along with our other sweets and savouries. We quite agree! Visit our shop to try a pot Creamy Earl Grey for yourself, or order it online to enjoy at home. The Secret Garden has been a long-time supporter of BC Children’s Hospital. Recently we had the pleasure of hosting one cancer patient and her parents for Miracle Weekend, an event which has helped raise over $200 million for BC Children’s Hospital since 1988. This video shares more about the family’s visit to Secret Garden. Proceeds from our black tea blend, Children’s Hospital Vanilla, also go to BC Children’s Hospital. You can purchase this tea, a playful blend of baby rosebuds, vanilla, and bergamot, at our store or in our Online Shop.